Her next involvement in the case was on Sept. 9, 2011 when Staff Sgt. Mike King asked her to transport a box of evidence to the RCMP office in Fredericton. Knee asks what she noted about the contents of the box. It was sealed, she says. Alan Gold begins cross examination of Cst. Shanda Weir. When you had Richard Oland’s car towed did you put yellow police tape around it? Yes. To warn people this is potential evidence? Yes. Ever see any tape like that around Richard Oland’s office? No. Lead defence lawyer Alan Gold begins cross-examination. Asks Weir about the fact she taped off victim's vehicle in police parking garage with caution tape, but she didn't notice any caution tape at the crime scene at 52 Canterbury St.
Any idea who opened that back alley door? No. It was open the whole time you were there? Yes. Anyone check it for fingerprints or examine it in any way? Not while I was there. Court in a brief recess. Gold asks if she heard forensic Sgt. Mark Smith tell anyone to get out of the crime scene. No. Did she hear Smith say anything to anyone? Not at all. Gold asks Weir about the box she transported to the RCMP in Fredericton. It was opened in her presence, she says It contained a PalmPilot, cellphone, 2 laptops and computer tower. 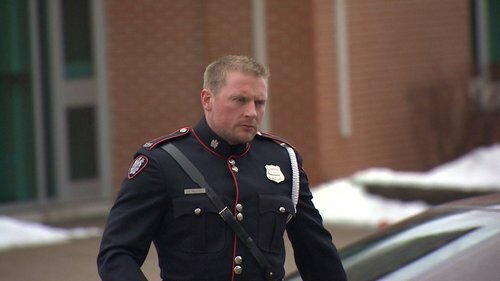 Crown calls a sixth officer to the stand - Cst. Ben Macleod. He was in charge of scene security after Shanda Weir late in the day and into the evening. Crown prosecutor Jill Knee now questioning Const. Ben MacLeod, who relieved Weir conducting scene security in foyer of second floor of 52 Canterbury St on July 7, 2011, around 6:18 p.m.
What area identified as ‘scene ‘ for you to guard? asks Knee. MacLeod testifies he was advised to "keep an eye on" the whole second story, "but specifically that office area." He never entered the office, he says. Spent most of his time either sitting on a chair by the back door or standing in the doorway. The door was open when he arrived and remained open, he said. it was a warm night and he tried to get some fresh air there, he said. He could hear "screaming and hollering" coming from the bar district at the front of the bldg, he says. No noise coming from the back alley. Macleod briefly cross examined. Long night? You were there until after 6:40 in the morning? Yes. Did you have occasion to use the office washroom during the night? No - I don’t recall using the washroom. Forensic Sgt. Mark Smith arrived arrived around 6:20 p.m. and entered the bloody office area, says MacLeod. He didn't keep a close eye on him. "I could only assume he was processing the area," he says. "I just left him to his duties." 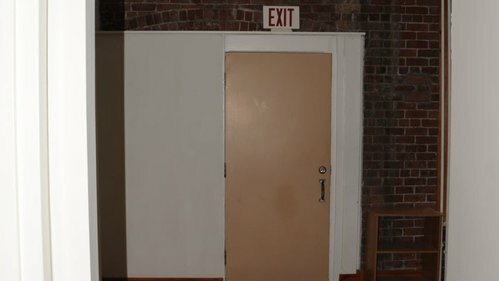 There was evidence at the first trial that officers did use a washroom adjacent to the murder scene before it could be checked for evidence. MacLeod maintains it was not him. Bldg owner arrived at 6:37 p.m. to drop off a spare set of keys to the bldg, which MacLeod turned over to Smith. 2 RCMP tech crimes officers arrived around 6:54 p.m., he says. Oland defence lawyer James McConnell notes MacLeod was on the scene a long time. Asks if he used the washroom while he was there. He says he doesn't recall using the washroom. Not ever? Not in that bldg, he says. First trial in 2015 heard officers used the washroom for two days before it was tested for forensic evidence. No more questions for MacLeod. He's excused. Crown prosecutor Jill Knee apologizes to Justice Morrison. "I’m not very good at scheduling it appears," she says, suggesting court take the afternoon recess now so the Crown can line up its next witness. Defence is putting forward the theory that the real killer murdered Richard Oland and possibly fled out the back alley door which police ultimately never check for evidence. When officers first arrive it’s closed but later is wide open with no evidence yet on how that happened. 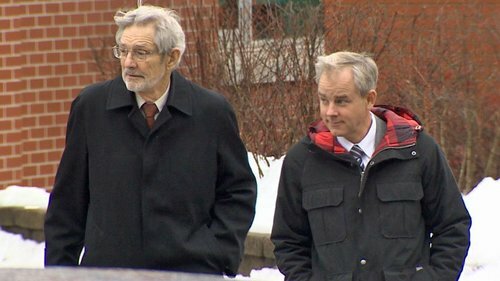 Preston Chiasson, who along with Maureen Adamson first found Richard Oland’s body is unable to testify in this trial and all sides have agreed to replay video of his testimony from the first trial instead. Crown did the same thing for Maureen Adamson's husband, William Adamson. His 2015 testimony was played for the courtroom on Friday. Chiasson often worked downstairs and knew Richard Oland. The two had many conversations over the years and Chiasson was deeply affected by the tragedy and what he witnessed. It shows in his 2015 testimony and it was agreed he could be spared reliving the ordeal again. What did you see? asks Crown prosecutor P.J. Veniot. "Richard on the floor, slaughtered," replies Chiasson. Chiasson called 911. Reported a "man down." Went downstairs to wait for police to arrive. Escorted Maureen Adamson. She was "in great distress,"he says. He was also "freaking out," he says, and doesn't recall exactly where he went. Veniot asks Chiasson what he first noticed when he went upstairs. The smell, he says. "It was nauseating." Veniot asks if he went back upstairs at any point. No. Chiasson required medical attention after seeing Oland’s body - “Richard on the floor, slaughtered," says Chiasson. He says he was “freaking out” that day and paramedics called to the scene treated him because of his extreme reaction. Veniot is about to show Chiasson some crime scene photos. Advises the court some will be graphic. Presiding judge at the 1st trial, Justice John (Jack )Walsh, Walsh address the jury. "I can’t cushion you from these photographs, they are what they are," he said. “You just need to be ready for them.” Judge also gives "fair warning" to people in the public gallery, including Oland family members. Tells them they are free to leave and come back later if they don't feel they can handle seeing the graphic images. Veniot leading Chiasson through series of crime scene photos now. Did you notice anything on the floor at all? asks Veniot. "No. Just focused on Richard," replies Chiasson. "All I seen was Richard." Chiasson says he never went any farther than the edge of the corner of the table. "As soon as he [Richard] came in view, I stopped," he says. Oland's former defence lawyer Gary Miller handled the brief cross-examination of Chiasson at the first trial. Asked him about the back door and alleyway. Chiasson says he's familiar with the area. He would sometimes "hang out" out there, "catch some sun." Miller showed him a more recent photo of the area. Asked if he could confirm whether a pile of debris and garbage pail with cement in it had been present on July 7, 2011. Chiasson says he can't recall. Venoit had no questions for Chiasson on redirect. Video of testimony ends.